Haven't heard anything about this since the story broke in early July. Over the course of construction & post-construction, 500 has racked up an impressive 92 complaints, 21 DOB violations, and 47 ECB (DOB) violations. A longer-standing mystery is the fate of the empty lot at 487 Fourth, right across from the 500 condo building. This is the lot that made news last year when an "oddist's" on-site decorations became a bit too ghoulish for local residents. When I first moved here in the 80's this was an active community garden, and it was still listed as such into the 2000s, though it was non-functioning, having closed due to issues of soil contamination (it was previously a gas station). 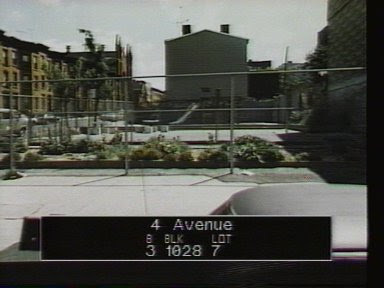 In 2009 its garden status was listed as Exemption Pending. In 2011 city turned over the site to Mercy Housing, for use as a low-level group home, but nothing much has been happening here, and apparently the gas tanks buried underground still need to be removed. There's been a smaller issue with masonry violations, with a Stop-Order still active, but it looks as though this may have been fixed. I've heard some rumors that the real reason work here is lagging is that the city now wants to share the site, and build up (up, up) above the low level Mercy building. This rethinking of site usage, I was told, has led to an impasse, with Mercy holding tight to the terms of the previous agreement. I don't know how accurate this information is. The weedy lot was quite verdant this summer, but just got a recent mowing.